I had a fantastic day visiting Boston yesterday. It started with a short train ride in, then a visit to the Isabella Stewart Gardner Museum, a venetian palace that holds impressive works of art by Botticelli, Rembrandt, Singer Sargent and Velasquez. Isabella Stewart Gardner collected and carefully displayed a collection comprised of more than 2,500 objects—paintings, sculpture, furniture, textiles, drawings, silver, ceramics, illuminated manuscripts, rare books, photographs and letters—from ancient Rome, Medieval Europe, Renaissance Italy, Asia, the Islamic world and 19th-century France and America. 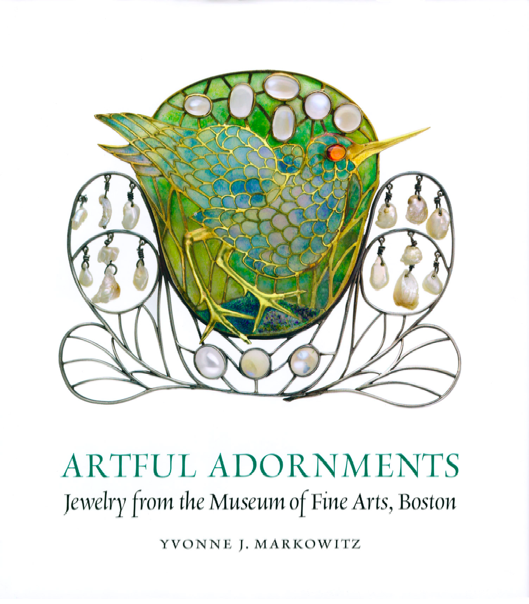 Then I was off to the Boston Museum of Fine Arts to see a gorgeous exhibition on jewels that included pieces by Verdura, Tiffany, Harry Winston and many others. This charming enamel marsh-bird decorated with moonstones and pearls was created by English Arts and Crafts designer Charles Robert Ashbee as a hair ornament that was later converted to a brooch. We finished the day by browsing in the shops on Newbury street and Beacon Hill. I'm delighted to say that the winner of J'Adore New York in the Splash Into Summer Book Giveaway is Lisa Richards of Lisa Loves Books.